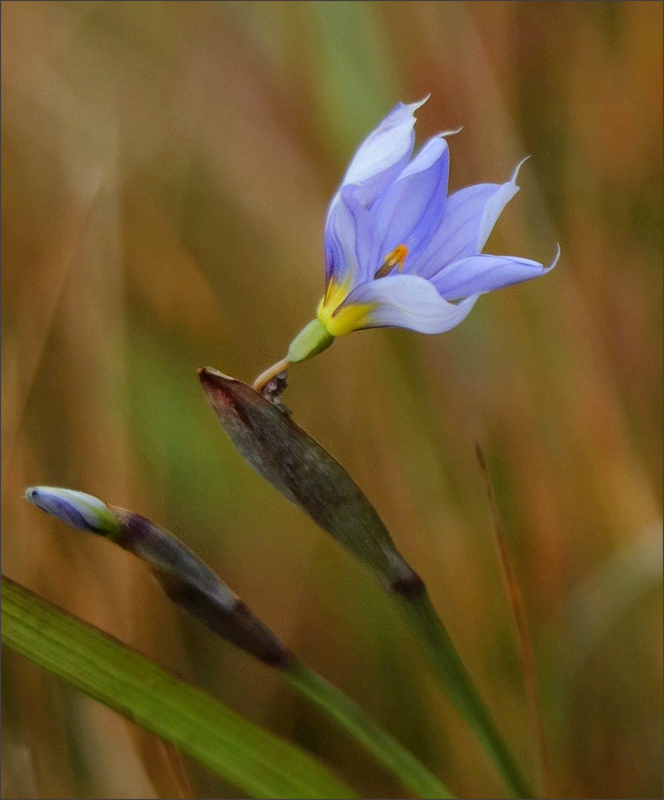 The spring flower known familiarly as blue-eyed grass isn’t a grass at all, but a member of the iris family. In addition, its ‘eye’ is yellow, rather than blue, but no one seems to care, and blue-eyed grass remains its common name. Most sources agree on March as the beginning of its bloom period, but this bud and flower were pushing the season a bit when I found them along the edge of FM 227 in Brazoria County on February 3. The emergence of the flower at a ninety-degree angle is atypical; perhaps the bud was damaged by the cold temperatures. While buttercups, a very few Texas dandelions, and ten-petal anemones are beginning to appear, this bit of color was a welcome surprise: a reminder that despite the continuing rain, cold, and gloom, spring is coming. Welcome indeed! I love this little plant, and won’t see it here for a couple of months. Your photo of it is stunning. I had to chuckle at your description~you are absolutely right, all details to the contrary nobody cares that the name doesn’t fit the facts. Common names can be great fun, as well as confusing. It took me a while to understand that the same common name can be applied to widely divergent plants, and that even scientific names can seem quirky at best. Another flower in the iris family that I enjoy is our Herbertia lahue. It’s ‘supposed’ to begin blooming in March, so it also may show up a bit earlier. Only a few days after our ice and freezing weather, I found another “something” blooming that I haven’t identified yet. The flower looks like it belongs in the Asteraceae family, but the stems and leaves look much like this blue-eyed grass. I’ll be glad to find out what it is. Oh cool I love coming across mystery plants! Oh, how we’re longing for that here (she said, gazing out the window at a deep blanket of white). Not for awhile, so I must buy them in pots for the house to be planted later. How I love this burst of color! It seems you were right when you mentioned in your last ditch-visit post that you were sure you’d be getting more snow before it’s all over. The past two or three years have been so mild here that spring didn’t seem such a big deal, but this year we’ve had a ‘real’ winter, making the sight of a few wildflowers especially pleasing. i’m glad you enjoyed this one — its color recalls your crocus. I have always loved that delicate blue-eyed grass and always loved it even when it wasn’t in bloom! it has an orderly and precise nature! I had been ‘shooting’ for a quick trip to the USA but my lower-back insists that I delay those plans.. On retrospect it will be great to visit when the spring flowers are in bloom.. perhaps I can paint a study a day while visiting w/family… Copa Airlines now has flights direct into New Orleans, saving half a day’s worth of travel and sometimes more – as well as about 700 dollars right now… When I’m able to fly, I’ll see if you have any road trips planned! Of course you would have had blue-eyed grass in your home territory. Since your mention of white wisteria, I’ve been looking at my photos from Mississippi, and now realize that was one of the flowers I came across in a pecan orchard near Doro Plantation one April — along with spiderwort and what appear to be white daffodils. I suspect those might have naturalized, but they surely were pretty. I hate to hear you mention back problems. I hope they’re not significant, and I hope they ease soon enough that you can travel as you choose. In the meantime — safe travels back to Poza Honda. These flowers were/are always one of my favorites. Early announcers standing defiantly up straight and tall to be first of the line of blooms. This one is “you can be cold to me but I may be bent but not broken” proud, it seems. In the past couple of days my transplanted E TX woods violets who should not be thriving in this area but are burst out into carpets of green leaves and purple. (For Mardi Gras?) Doing a lot of outdoor plant rehab now – between downpours – not much time as blasting heat is on the way…78 this week? Another reason my it’s so irritating to have a miserable wet winter: winter is the only time it’s really really nice to be outside., Summer: ugh. But the wild flowers should be gorgeous this spring. An acquaintance in Wharton mentioned that her violets are blooming, and that the ten-petal anemones are thick there. That’s what I was looking for when I found this blue-eyed grass. I never found a single anemone that day, but this was a fine consolation prize. I want to follow your forecaster! The warmest I’ve seen for the coming week is 67. I certainly won’t reject that, but 78 sounds even better. I see conflict-ridden days ahead. When the weather finally turns nice, as I presume it will, I’m going to have to work first and roam the fields and glades second. I’m trying to steel myself for the inevitable struggle. In the meantime, it looks like more of the same for tomorrow. Your flowers near the coast are ahead of ours in central Texas this year. All I’ve seen so far is one alien dandelion. In the process of poking around, I also discovered that Wilfred was the earliest influence on James Turrell, whose aunt dragged him to the Museum of Modern Art as a youngster. She hoped Monet would catch his interest, but it was the light installations of Wilfred that he found compelling. I learned about synchromy from this painting in the Michener Gallery in Austin. That’s a beautiful example. Stanton Macdonald-Wright is a name I came across in my reading, with occasional note made of the representational aspects in some of his work. I read the word as giftifying, as in making a gift of something to someone. You could say the painting in question is a gift to museum visitors. That’s true, too, and much more appealing. Much of the time, I find .gifs irritating. That’s a beauty! And early. We have a relative of it here although I’ve only seen a few (Sisyrinchium idahoense) and they bloom in June and July. I was amused to see this note when I looked up your species: “One of the most perplexing groups of plants, with many, often intergrading, variants named as species.” My book says of blue-eyed grass, “Sixteen [species] have been attributed to Texas…and can be separated only by close examination and reference to detailed keys.” Not only that, they hybridize, making things even more complicated. But they are pretty things. No need for a key or a microscope to see that! Yes they are very pretty. The ones I’ve seen here have been pretty far into the back country. That’s what I always liked about crocus. My mother planted them in the front yard when she first moved there and I would look for them to come up through the last snow of the year in all their purple glory!! These blue-eyed grass blooms reminded me of them. I don’t remember crocus being a spring flower when I was growing up in Iowa, but it may be that my mother didn’t plant them. She was quite a fan of tulips, and devoted most of her flower garden space to those. They certainly are beautiful flowers — they must have pleased your mother, as well as giving you real enjoyment. I suspect it won’t be long until hyacinths begin appearing in our grocery stores: another example of that luscious color. Agreed, they are bright and cheery. Make me think of Easter. Like Steve, my eyes were drawn to the background which is gorgeous! It’s amazing what a macro lens can do with a roadside filled with dry grasses and occasional green blades. I’ve also discovered that gray, gloomy days can be just fine for wildflower photography — especially when there’s a wildflower around. This one’s a little early, but not by much. I’ve wondered whether the flowers that spring up alongside the roads might not be benefiting from the extra warmth concrete and asphalt bring. Another of our early bloomers — crow poison, or false garlic — is the most abundant flower right now. Even though I’ve found some in a field or two, it seems to be clustering along the roads. Yes, the roadside edges are a wonderful place for plants. Warmth from the sealed surface, and moisture run-off, seems to provide to their needs nicely. Hmmm… I see my comment is there, so all seems well. I’ll be by to read about the gum tree and fridge in a moment. Very pretty! We’re still working with kind of a salty gray-on-gray color scheme around here, so boy that flower looks pretty special. You said Spring is coming, and so I know we can take that to the bank, but hard to believe in the northeast right now. You must know Iris DeMent? I love “Our Town”. We have blue flags in New York, also really pretty, and I thought we had yellow ones, too, I see them in the marshes, but just checked and found out they’re “introduced.” That sounds a lot nicer than “invasive” doesn’t it? I’d be pleased to meet some flowers about now. sorry! keep forgetting to put the link in brackets! The brackets are one way to keep the video from appearing, but you also can create a clickable link by using this easy html code. We’re gray-on-gray around here, too. There haven’t been more than a few hours of sunshine since I took this photo, and even before that it was either cloudy or foggy for at least two weeks. My sympathy for those of you in the north always increases this time of year. I do know Iris DeMent, and “Our Town” is one of my favorites. I always liked Northern Exposure, for that matter, and was sorry when it came to an end. I got to see her in concert, years ago, and it seemed as though it wasn’t a good time for her, although things seem to have improved. When I moved to Texas, the phrase “flag pond” was mysterious to me. When I heard that a local hero was buried by the flag pond near his home, I imagined a pond with a flagpole next to it. Eventually, I figured it out. I’m still so much of a midwesterner that ‘spring’ means April or May to me. This year, I swore I was going to start paying attention in February, so I didn’t miss so many of the early blooms. I’d be out there today if it weren’t pouring down rain. What a glorious blue it is too. Wonderful image. Surprising how many flowers are just starting to bloom in the northern hemisphere. I remember that you like blue, so this is your sort of flower. I was pleased to find it, and I thought the odd angle of its bloom was charming. The bud in the photo obviously is going to bloom normally, so I think the flower must have been just far enough ahead in the process to be affected by the cold. The damage looked more like frostbite than a bug bite. That is such a lovely blue you have captured, Linda! Beautifully done! Thank you, Pete. Small bits of color like this certainly show up in the midst of a late winter landscape. They’re fun to discover, and fun to share. I’m glad you enjoyed it. Beautiful flower and very nice bokeh. I have shot some Irises also (only two) and they have those “grassy” leaves (acicular=slender and pointed, needle-like). Actually, they are ‘lanceolate’ (lance-shaped; widest below the middle and tapering at both ends). And they’re fairly rigid, too. That, and their lance-like shape, helps to explain why they were so useful as “swords” when we were children, fighting our imaginary battles. They sure are. I also just corroborated that the ‘Gladiolus’ is also from the Iris family (‘Gladiolus’ is the diminutive of ‘gladius’, meaning ‘sword’ also in Latin). Gladiolus is of course not native to the U.S. but it’s a member of the Iridaceae family. I remember you told me they reminded you of funerals. That’s right. Strangely, I don’t think of the color blue when I think of “glads” (as we called them). Yellow, white, red, pink, and salmon were common, but I don’t remember blue or lavender. Perhaps the other colors were more common and less expensive. It is lovely, as well as being a reminder that the time has come to start scanning the ditches for irises. Those slender, pointed leaves are such fun to see when they first appear, but especially in our wet and swampy areas they can be hard to spot in the midst of so much other new growth. Looking at my blue-eyed grass photos from previous years, I remembered that I have images of some white morphs. There’s also a white blue-eyed grass, but it has purple around the yellow eye and usually a hint of color in the petals, so it’s pretty easy to distinguish from the mutations. How I love this, Linda! The next best thing to seeing my own flowers is seeing the change of seasons via my blogging friends. I wonder if this blue “eye” wasn’t reaching toward the sunlight?? If you look at the bud next to it, Debbie, you’ll see how the flowers generally open, emerging nice and straight, in line with the stem. It’s hard to see in the photo, but the tip of this flower’s bud was damaged somehow. I think it may have been the cold weather that shriveled and closed it. With no way to emerge as it usually would, the flower just made a turn and bloomed at an angle. Clever flower, no? Persistent, too! Nature makes a way of doing what it’s supposed to, and aren’t we blessed for that?! Indeed we are — and we can draw a little inspiration from her, too. I adore blue-eyed grass and had never looked it up. But I had reasoned that it really was not a member of the grass family. It looked too much like an iris, even though the flower is so tiny. This is a great photo discovery so early in the year. Indeed it is a welcome sight for my winter blues that last all winter and for months. We’re still cold and gray here, and it’s supposed to stay either cold and gray or warm, foggy, and gray for the rest of the week. Like you I’m ready for a little spring. I’m hearing reports of flowers north of here, along the 59 corridor between Houston and Victoria. I stopped at a couple of places where I’ve seen anemones in the past, but there wasn’t anything to be seen except for crow poison. I know what’s going to happen: the weather is going to turn, and I’m going to have to work in the sunshine instead of flower-hunting in the sunshine. Grumpgrumpgrump! But one of these days the iris, and Herbertia, and paintbrush will appear, and we’ll forget this “real” winter we’ve been having. This is an absolutely lovely photo. I love the colors and mood. Thanks, Ali. I’m glad it brought you pleasure. I certainly was happy to find a spot of color along the road. Even though we don’t experience a great deal of snow and ice here, the gloom has been substantial, and everyone is on the lookout for spring beauties. Spring is most assuredly on its way. I’m seeing more thickening of limbs and buldging of leaf nodes–can’t stop it now!! I enjoy a little blue-eyed grass that some puff of wind or flutter of a bird’s wing planted in a crack of my back patio. Its foliage is greening-up! I look forward to the charming blooms, but am sure I won’t get a photo of one as beautiful as the one on this page. I think any color would look beautiful to us at this point, Tina. I saw that Austin had more — interesting? — weather yesterday. Someone had posted two photos: sleet, and a rainbow. Enough, already! Your mention of the leaf nodes reminded me that a line of trees I see along a certain road are beginning to turn their spring red. I think they might be willow. It’s funny: if you look at them directly, you can’t see the flush of color, but a sideways glance picks it up. If it weren’t for good peripheral vision, I’d miss a good bit — like this little flower. I’m glad you have blue-eyed grass, too. It’s a beauty. Daffodils, tulips, hyacinth — they’re all tough, and really do seem to thrive in the cold. A few people here got a little over-enthusiastic and put some tropicals out, only to have yet another cold front roll through. Tomorrow? We’ll be in the upper 70s. This weekend? Happy roller-coaster! Our planting calendars here make recommendations on when to expect the last frost, but Mother Nature doesn’t have to cooperate! The truth is we’re experiencing what I’ve always thought of as a normal Gulf Coast winter. When I moved here in the 1970s, and then moved back in the 80s, ice, extending cold, and occasional snow flurries were quite common. Especially the ice. So, in that sense, it’s good to see more normal patterns. People like the peach growers are happy; for a couple of years they haven’t gotten the chill hours for their fruit. There’s no problem with that this year! It’s so interesting to see what we share and what we don’t –of course, even in Texas there are wide differences from one area to another. It certainly keeps things interesting.